The one film you should not see alone. Our modern world is full of marvels - but also polluted air, foods sprayed with deadly chemicals, misused drugs and hidden radioactive substances. Ever wonder how these poisons might affect a developing child in theiwomb? It's Alive offers a shocking possibility - and in so doing has become a creepy cult classic! 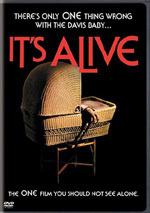 It's Alive is the first film of the now-legendary terror trilogy from writer/director Larry Cohen about murderous mutants - and its birth was chillingly midwived by the crucial contributions of two Academy Award winners: makeup master Rick Backer (who created the makeup and "played" the infant monster) and composer Bernard Herrmann. Discover It's Alive for yourself. A baby's cry will never sound the same. With flicks like Rosemary’s Baby and The Omen, we got tales about demonic children that went for the subtle side of things. Both flicks never played out matters in a literal way, as they left it up to audience interpretation to determine the reality of the situation. Don’t expect that kind of approach from 1974’s It’s Alive, as it plays out events in a significantly more overt manner. We meet the Davis family, with father Frank (John Ryan), mother Lenore (Sharon Farrell), and 11-year-old son Chris (Daniel Holzman). Lenore is due to give birth, and the early parts of the flick show this process as she goes into labor. Problems arise. Lenore produces a violent monster baby who slays all of the delivery room personnel except its mother. It then escapes, which triggers a manhunt headed by police Lt. Perkins (James Dixon). The movie follows the police pursuit and other investigations, the baby’s killings, and the impact on the Davis family. To my surprise, that latter elements plays a rather large role in the proceedings. That factor makes Alive more memorable and distinctive than I expected. I thought I’d find a cheap piece of schlock with little more than cheesy “monster baby” scares. Sure, the movie tosses in some of those moments, but it maintains a generally subdued tone that manifests more depth than normal. Early on, the movie sets its tone as it gently introduces us to the participants. The beginning scenes don’t warn us of the problems to come, as it focuses wholly on what seems to be an average family as they deal with the childbirth. 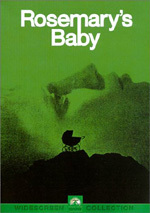 Not until Lenore gets into the delivery room to problems emerge, but if you don’t know anything about the movie’s premise, you won’t anticipate what happens. Even when the bloodshed occurs, the film remains restrained. We don’t see the attack. Instead, we watch as a maimed hospital worker staggers out of the delivery room. It’s a nicely understated way to introduce us to the terror, and it works really well. Alive goes with the “less is more” model in how it depicts the baby, which seems like a good idea. The puppet probably would have looked goofy in extended shots, so the quick glimpses allow it to become more effective. Actually, the movie’s rare cheesy bits connect to the baby, particularly when we see things from its double-vision point of view. Nonetheless, those don’t last long, so they don’t create substantial distractions. I also like the movie’s ambiguousness. It sets up lots of potential bits of intrigue but doesn’t beat us over the head with them. We get hints that the monster baby wasn’t unexpected, and we hear vague theories about what caused the mutation, but we never learn anything concrete. Some may dislike these tendencies, as they can come across as wishy-washy. However, I like the vagueness, as the film triggers our imagination to fill in the blanks on our own. I can understand why some would see it as unsatisfying, but I like the fact it doesn’t spell everything out for us. I really didn’t expect the movie’s emphasis on the lives of the Davis family. The film concentrates a lot on how the developing events affect the clan, and it displays a surprising amount of compassion within that area. I can’t really call the movie “deep”, but it displays layers that I didn’t anticipate from a film in this genre. Half cheesy shocker, half sociological study, It’s Alive surpasses expectations and turns into a reasonably effective movie. It leaves just enough to the imagination to keep us interested, and it follows its story nicely. Chalk it up as a good horror flick. It’s Alive appears in an aspect ratio of approximately 1.85:1 on this single-sided, single-layered DVD; the image has been enhanced for 16X9 televisions. I didn’t expect much from the visuals for a cheap horror flick from the mid-Seventies, but Alive mostly looked pretty solid. Sharpness usually remained distinctive. Occasionally the image became a bit soft and ill-defined, but not with much frequency. The majority of the film came across as nicely detailed and concise. I noticed no issues with jagged edges or shimmering, but a little edge enhancement popped up at times. As for source flaws, the movie mostly appeared clean. Some specks, grit, nicks and blotches showed up sporadically but never created significant distractions. Colors varied but usually came across well. Most of the hues were appropriately bright and full. Some shots looked a little flat and dingy, but not many of them suffered from those problems. Blacks were deep and tight, while shadows seemed a bit less consistent. Though low-light shots mainly appeared smooth, they sometimes were somewhat too dense. Part of that stemmed from some awkward “day for night” shots. Despite these minor issues, I thought Alive presented a satisfying picture. Nothing special came out during the monaural soundtrack of It’s Alive, but it was perfectly acceptable for a product of its era. Speech occasionally sounded somewhat reedy and flat, but mostly the lines were natural and distinct. I noticed no issues with edginess or intelligibility, though the mix sometimes made dialogue tough to hear because it favored the music too strongly. Bernard Herrmann’s score lacked great vivacity, but it was reasonably bright and lively. Effects also failed to demonstrate much range, but they didn’t suffer from any overt concerns like distortion. Ultimately, the audio was lackluster but decent. In addition to trailers for It’s Alive, It Lives Again, and It’s Alive III: Island of the Alive, we find an audio commentary from director Larry Cohen. He provides a running, screen-specific chat. Cohen goes over topics such as the cast, how he came onto the project, problems with the film’s promotion, its slow path to success, and general production notes. Cohen talks a lot about his relationship with Bernard Herrmann and offers many interesting notes about the famously prickly composer. Too much dead air mars the commentary, as Cohen occasionally goes silent for extended periods. Otherwise he offers an entertaining chat with a reasonable amount of good information about the flick. On the surface, It’s Alive looks like little more than a cheesy schlock horror movie. It includes some of those elements but proves classier and richer than I expected, as it gives us a look at the human toll behind the action. The DVD presents good picture with mediocre audio and minor extras highlighter by a pretty interesting audio commentary. It’s Alive holds up well after 30 years and remains a surprisingly good monster movie.